It was an all Bast night Friday evening at Auburn’s Fast Friday’s Motorcycle Speedway. Cousins Bart and Ryan Bast stood high on the winner’s podium drenched in champagne after celebrating their respective wins. 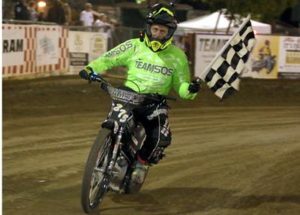 Bart Bast won the scratch main event, being the first rider to beat national champion Billy Janniro in the scratch main event this season at Fast Fridays. 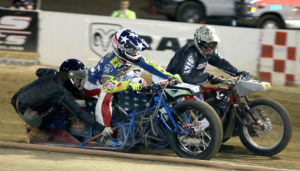 Ryan Bast was victorious in the handicap main event, and finished third in the scratch main event. The handicap win was his first main event win this season. 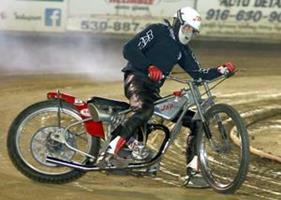 Both Bast’s are members of the very successful and well recognized speedway racing Bast family. 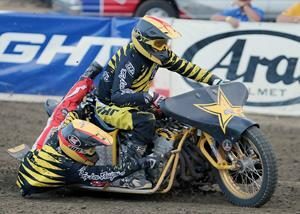 Ryan Bast’s father and Bart Bast’s cousin Mike Bast was a seven time USA AMA National Speedway Champion. 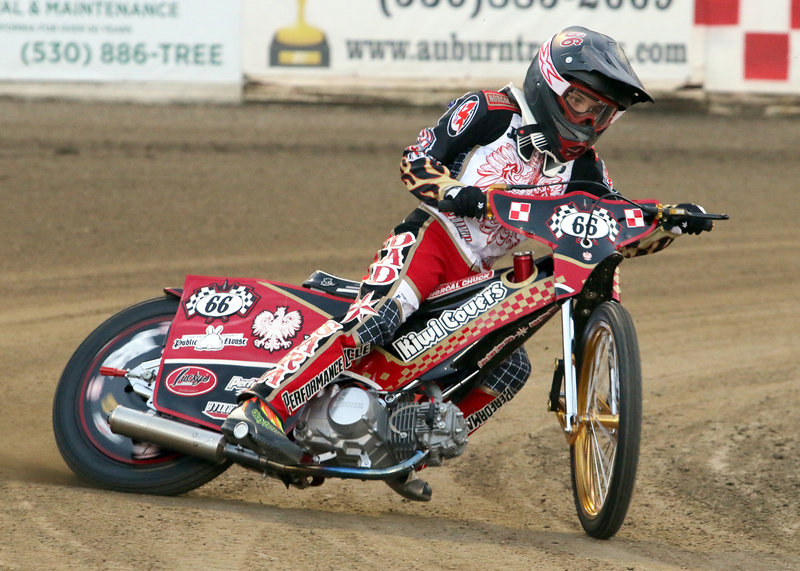 Most of the extended Bast family members have thrown their leg over a speedway bike at some time or another. Local speedster Sammy Tetrault won the Division II main event. After a short stint in Division III with a couple of first place finishes, it looks like Tetrault has found a home for now in DII. Tetrault is only in his first season on a 500cc motorcycle moving up from the youth program this season. Watch out for this young man, he is evolving into a fast rider. Aaron Sorani was second and Charlie Haines was third. Another first time main event winner this season, Peter Pecorilla took the checkered flag in the third division main event. He had his hands full with second place finisher Dakota VanderBroeder but held on for the win. Michael Bretzing was third. 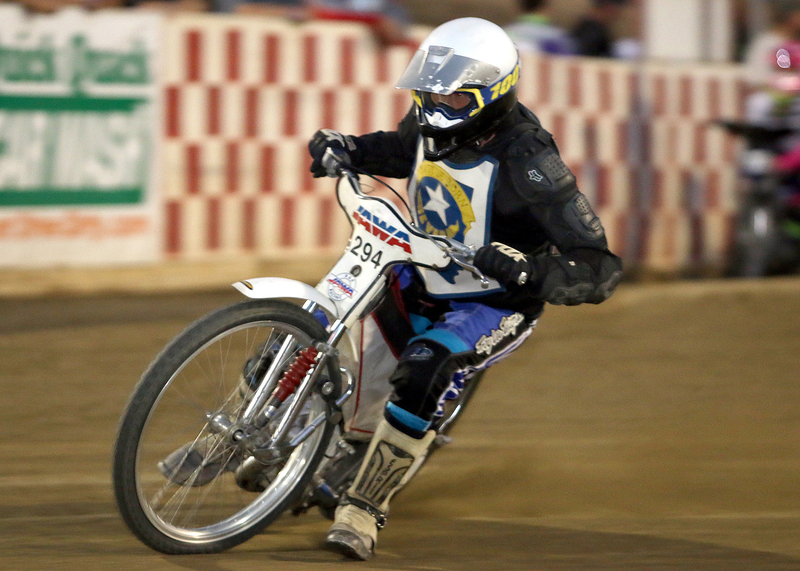 In the Youth 250cc main event, Landon Norton, who seems to have grown six inches over the off season took the win. 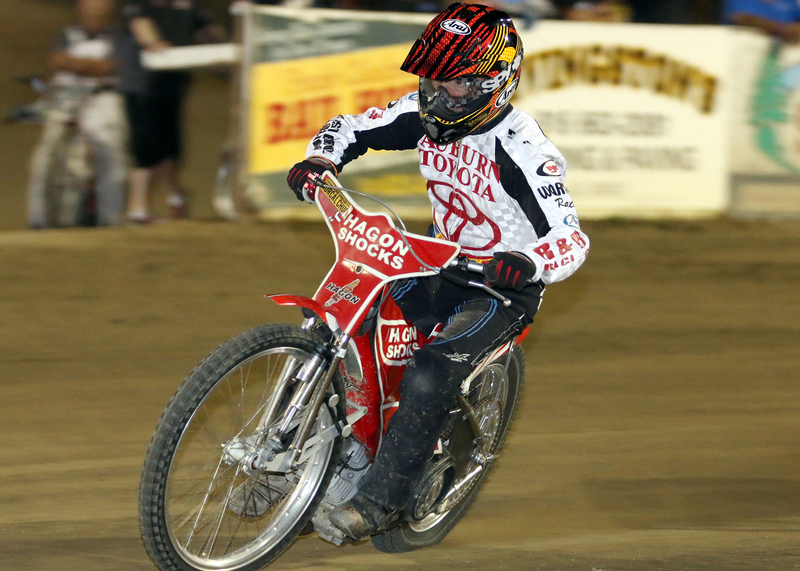 The fourteen year old from Folsom has two 250cc main event wins under his belt so far this season. Second was Cameron Krezman who also has a couple of main event wins this season. Up from Southern California Jake Isaac was third. 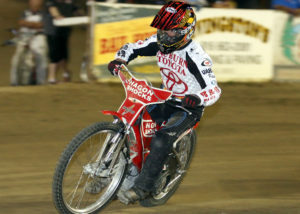 Timmy Dion topped the Youth 250cc consolation main event, Enzo Sorani was second and Greg Moore was third. 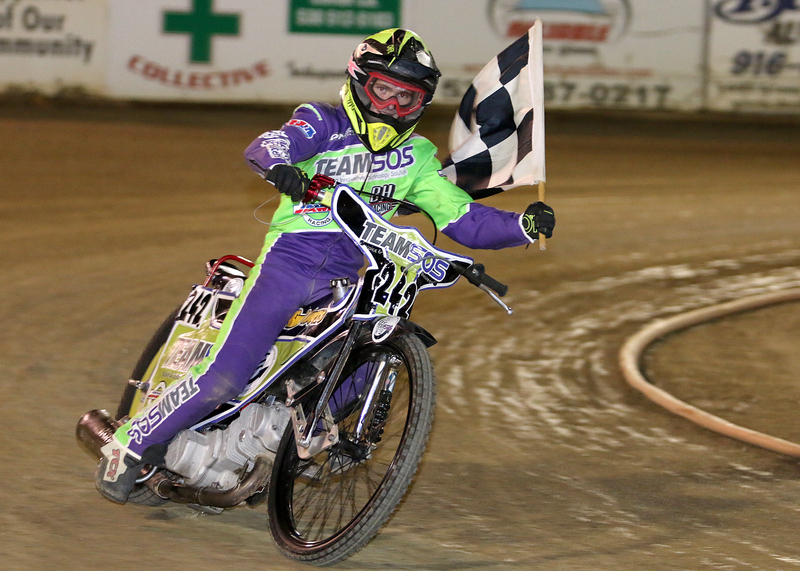 Charlie Trana continued to dominate the Youth 150cc program with another main event win, his third of the season. Kaytie Kangas was second. Friday night at Fast Fridays the Extreme Sidecar teams return for their second round of sidecar racing. 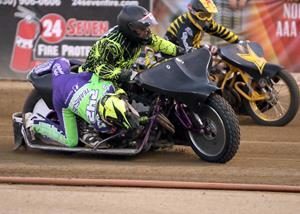 The three wheeled 1100cc sidecar insanity takes to the Fast Friday’s dirt oval with exciting action racing. This is the second of four appearances the sidecar teams will make at Fast Fridays this season. 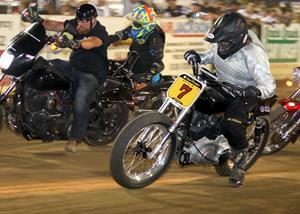 Auburn’s Bart Bast picked up a win in the scratch main event Friday night at Fast Fridays. Bast is the first rider this season to beat national champion Billy Janniro as the fastest man of the night. Cousins Ryan Bast (left) and Bart Bast (right) celebrate their wins at Fast Fridays Motorcycle Speedway. 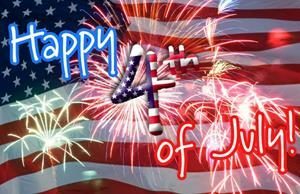 Ryan Bast won the handicap main event and Bart Bast won the scratch main event. 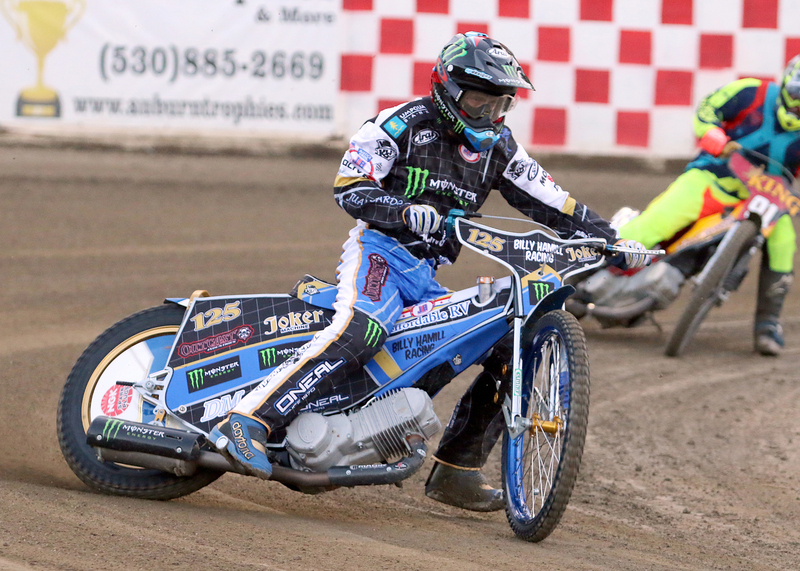 Both racers are members of the Bast family, well known in speedway racing. Folsom’s Charlie Trana won the Youth 150cc main event. Peter Pecorilla won the Division III main event. 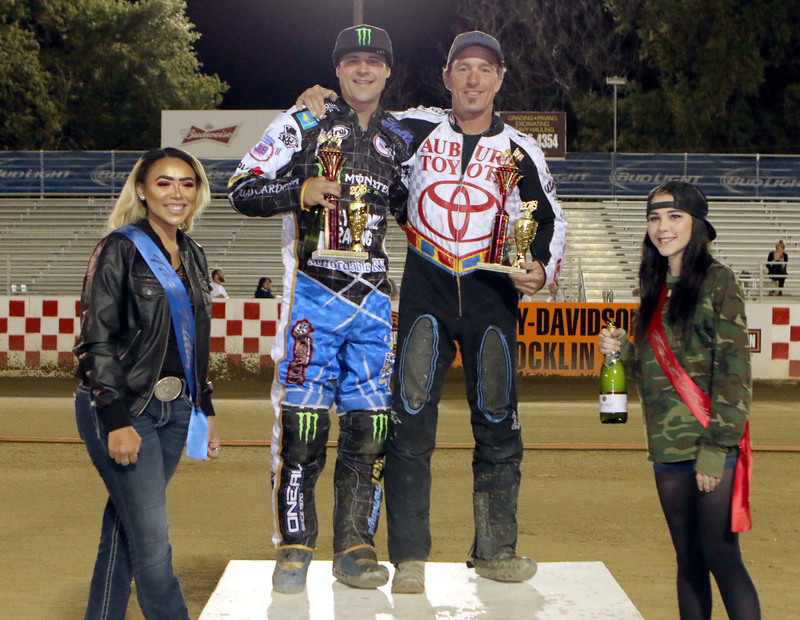 Ryan Bast won the Division I handicap main event. Advancing quickly from the youth division last season, Sammy Tetrault won the Division II main event. 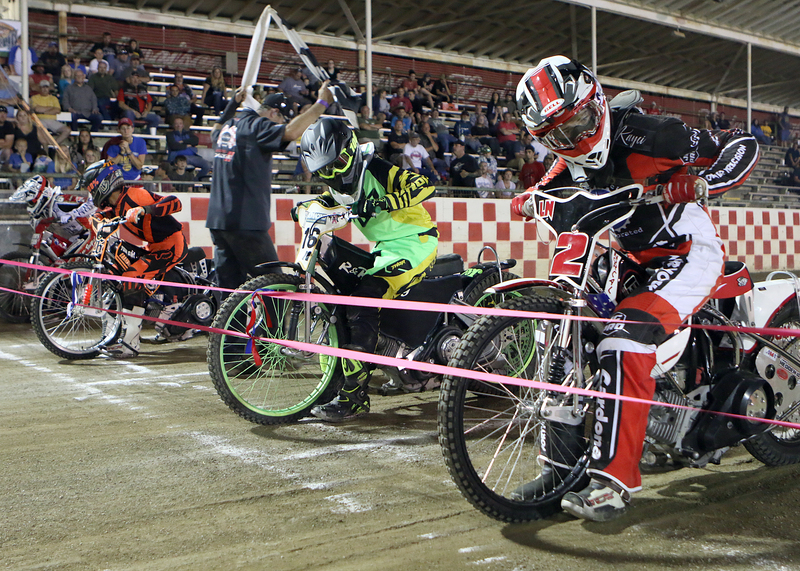 Landon Norton (near) starts the Youth 250cc main event Friday night. Norton won the event, his second of the season.